Like the Books of Samuel and Kings, 1 and 2 Chronicles was also written as the single Book of Chronicles in the Hebrew Bible. Many readers today, however, skip reading it when they find that it repeats much of the material from its previous books. But is Chronicles necessary to read? Yes, it is! From Adam to David and beyond, 1 and 2 Chronicles begins with genealogies of important players in the storyline of God's Messiah and the priesthood. David and Solomon's lives are recapped, detailing their accomplishments and building God's temple. An example of the new King David" is established in this arrangement." 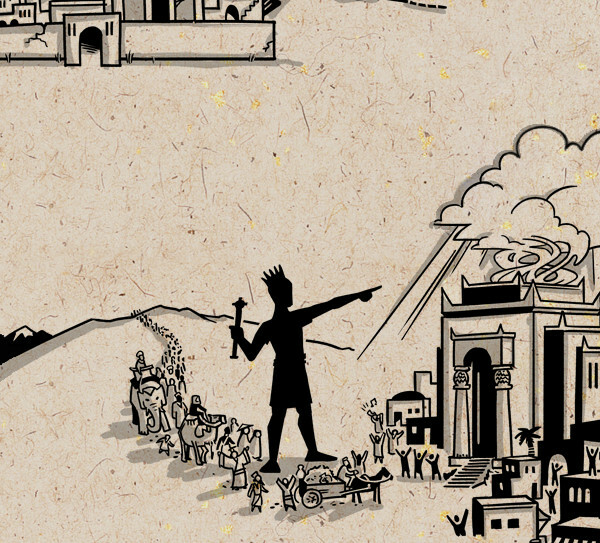 As Chronicles reflects the positive elements of Israel's past, themes of hope for the Messianic king and the post-exile rebuilding of God's temple are highlighted. Stories of good, evil, hope and courage are accounted through David's royal lineage in the kingdom of Judah. Asa, Jehoshaphat and Hezekiah are especially noted. After decades of exile, Persia overpowers Babylon and allows Israel to return home. King Cyrus proclaims their release, though his last sentence is left unfinished. Chronicles is the last Book in the Hebrew Bible as it summarizes the continued relationship between God and Israel through the Blessing of Abraham. The arrangement of the content in Chronicles invites the reader to explore the stories of each section and reveal interesting details about David, Solomon, God's temple, the kings of Judah, and how they work together. Chronicles is also an excellent historical reference for those studying specific facts in the Scriptures. Time to pull up your sleeves and embark on a treasure hunt to dig up the "gems" in God's Word!